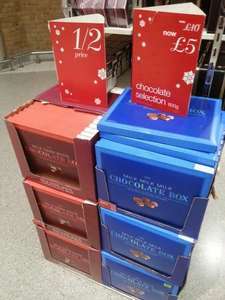 Just saw these 2 boxes stacked outside Marks and Spencer Shoreham. They are huge and look like a good pressie at £5 down from £10. Yay for obesity and early onset diabetes! Cold! The Roses/Celebrations/Quality Street tins are the same price but have nearly 1kg in plus they're big brands rather than cheap supermarket crap. This is a very bad deal. Since when was Marks and Spencer not a big brand or cheap supermarket crap? Certainly better than Quality Street. in my opinion. have you checked the size of quality street tuns un recent years? Nice, as a present. Also their Christmas cakes are a 1/3 off. I have bought some of their small ones which look beautiful for £3.33. I am making all the elderly members of my family a Christmas Hamper, similar to the Mand S ones I normally buy for £30. In each one chocolates, christmas cake, conserve, teabags, christmas mini chocolate logs, tin of salmon and a tin of soup. Reckon each one will cost approx £14. @Retgf I'm sorry but the Roses/Quality Street tins are now 795g. That's including wrappers. I was talking about the actual product as that is a fairer comparison. Voted hot I love marks Chocolate. Well they must have been £12 because I bought 4 boxes from Dover and having just checked my till receipt, note that I paid £6 per box, not £5. Another trip to the store tomorrow for a refund! Watch out that you don't caught as I did! I wonder how many don't check their till receipt!